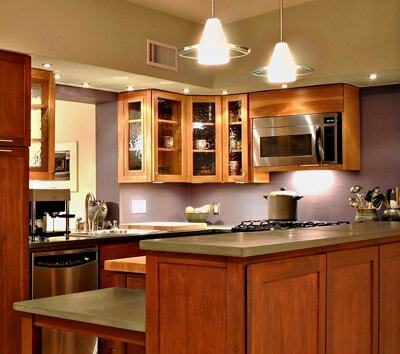 This kitchen employs various types of lighting to achieve a warm, sophisticated ambiance. Interior lighting can be divided into three basic categories–task, accent, and ambient–with different types of fixtures that each perform one of these functions. Task lighting, which illuminates the area where an activity such as reading or food preparation takes place, is best served by single fixtures that direct light onto the work surface. 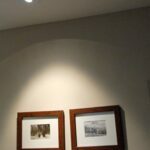 Accent lighting is primarily decorative, one-directional lighting that focuses attention on artwork or architectural features or simply sets a mood. Ambient, or diffuse general lighting, provides a low level of soft light that complements such activities as watching television or entertaining. 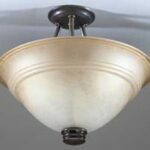 Lighting professionals often suggest you choose the bulb first and then the fixture. The type of light you select is a matter of personal preference, but energy efficiency is a growing concern for many homeowners. 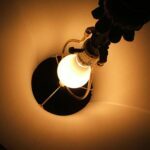 Popular bulb choices today include quartz-halogen, fluorescent, and incandescent varieties as well as the new generation of full-spectrum “natural” bulbs. 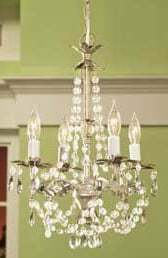 Surface-mounted fixtures are either mounted directly to a housing box (in the case of wall sconces and incandescent and fluorescent ceiling fixtures) or suspended from the box by chains or a cord. Some under-cabinet task lights plug into a nearby receptacle. Most surface fixtures come with their own mounting hardware, which is adaptable to any standard fixture box. Heavy fixtures, however, may require beefier attachments. Today, recessed downlights usually are pre-wired and grounded to their own housing boxes. These fixtures need several inches of clearance above the ceiling, so they’re most easily installed below an unfinished attic or crawl space. Where space is tight, you can buy low-clearance fixtures. New-work units, which are used where you have access, are easy to install; cut-in, or remodeling, models are also available. Many downlights produce a lot of heat, so you must either remove insulation within 3 inches of the fixture or buy an “IC” fixture that is rated for direct contact with surrounding materials. 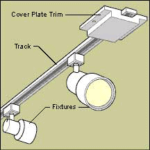 Track systems are mounted to the wall or ceiling either directly or with mounting clips. Power is typically provided by a wire-in connector that’s mounted to a housing box (plug-in units are also available). Tracks can accommodate pendant fixtures, clip-on lamps, and low-voltage spotlights, as well as a large selection of standard fixtures. Track connectors allow some systems to be extended indefinitely–in a straight line, at an angle, or even in a rectangular pattern. Tracks with numerous fixtures may be powered by more than one circuit.